We were blessed with three beautiful girls in July. Born far too early and tinier than we knew possible, Rory and Allison left us far too soon. Here's the journey of our family as we cling to the hope of finally bringing Slugger home. Ah, today is a good day. Casey is doing really well drinking a meal from a bottle twice a day. I've started to get up early so I can make it to her first bottle of the day. It's quite entertaining to be in the NICU in the morning as the doctors, nurse practicioners, and nurses have their big meetings in the morning. Babies have to be monitored nonstop so the meetings take place right there in the middle of the babies. I'm there in my old lady white chair holding Casey feeling like an intruder but no one really pays me attention. I'm usually in my own little world but I realized that someone was saying my name. Pam was looking right at me and said "Do you guys have a room ready for her?" I then realized everyone in the meeting was now looking at me as I mumbled "Ummm, not quite...almost?" Casey has a lot of tasks to conquer before she can come home. We are looking at her due date as a rough estimate of her coming home...but it could stretch weeks beyond that or a few weeks before. You just don't know how quickly they'll tackle their tasks and if they will have setbacks or not. Pam said "She could take a while or she could be home in as little as two weeks. You have to be ready no matter what." Two weeks!!! What!! I mean, a month is more realistic but I understood what she was telling us. Oh geez. It's starting to be a little more real that she will come home...and then it will be up to us to take care of her all by herself. She might still be on medication, she probably will come home on oxygen. Her nursery is half complete. We haven't picked her crib up. I have no clue what we have and what we don’t have. Oh, so excited and so nervous. She still seems so small and fragile. What does Casey have to do well before she can come home? 1. Take all food by mouth, that equals 8 x a day. Right now, she's been taking two meals a day and the rest are still by feeding tube. 2. Maintain her body temperature. She's been doing it for a week. Yah, Casey!!! 3. Come down on the oxygen. 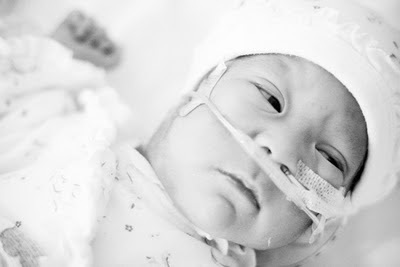 She's on room air (21% oxygen) and the cannula is just supplying pressure to open up airways. But she does need her oxygen to be bumped up to 25-30% when she's being fed or fussed with (diaper changes and physical therapy). I had a great time with Casey this morning and am waiting for Scott to come home so we can go back tonight. I got to see what exercises she does in physical therapy. And basically, I sat there holding Casey and pestered her nurses with questions. We’ve become so dependent on the staff there. In the very beginning, my dad told me not to worry if I couldn’t make it every day. But then Allison passed away, and I remember thinking that I was sooooo thankful that of her 19 days of life, I was there for every day of it. 19 days is just a blink in a year, but it was the only time we had with Allie. We became even more determined to be there as much as we possibly could for Casey. Thus that hospital room has become more of a home to me than my own home. And the nurses have become our extended family. When I broke down one day uncontrollably while holding Casey, I was surrounded instantly with hugs…suddenly water and chocolate kisses (the magical cure for everything=) were being thrust into my hands. My big sis is the mother figure in my life but she’s having a rough year. She doesn’t have a phone anymore so we can’t talk as much as we used to. Casey’s nurses are helping coach me through my first steps as a mom. They give me advice on the best blankets to use, the best baby carriers, how to make room in your freezer for milk. They’re coaching us on how to feed Casey, how to take care of her. And they make me laugh so much. Like Amy, who I love because she is so funny and she doesn’t even realize she’s being funny. Amy, who misunderstood me when I said Scott would marry the nurses if they ever needed it. Her eyes got super big and I realized I had to clarify that he would be the marriage OFFICIANT. I can’t believe she thought I was proffering up my hubby to be their husband as well. Boy, oh boy, Casey, I will miss your Aunties-in-scrubs when you finally come home. I am going to make it a goal to take pictures of all of Casey's nurses over the next month. Hi Auntie Amy. Thanks for taking such good care of Casey today. And for not taking me up on my offer to marry my husband. -we have been blessed by the thoughtfulness of our friends and families...food, flowers, 2 month announcements, stuffed turtles, text messages and emails...just this week alone. We can't write the thank you's fast enough. -more meals by bottle please!!! Yay! Great work, Casey! She has Scott's "look" down pat already, LOL. As for baby carriers.. don't buy one yet.. that's all I'm saying ;-) Also I saw on your Amazon wishlist you have the terry car seat insert- I have one we're done with I can pass along! And if you need a spare infant seat we should be done with that after our mainland trip next week. Casey you are so beautiful. just like your mommy. i'm praying for you sweet princess! Windward- ooh excited about not buying a sling. We don't need a car seat. That we actually have. Thanks for offering. So set. Updates will be posted at least every Sunday and Wednesday. Will post on other days if things come up or if I have something to share. Subscribe so you don't miss out. We love your prayers. Thank you for all the love for our babies. I'm a country girl from a little place called Honoka`a. Raise your hand if you can find Honokaa on a map. Hmmm, not a lot of hands raised. I love love my hometown. Now, I live in Kaneohe with my wonderful husband. Our home is usually filled with people, and always filled with God. I'm a nerd through and through. When I was in grade school, my goal was to read every book in the library. I think I got to the D's before I started skipping around. I'm a pastor's wife...I used to be a teacher, but now I have one of the most opposite jobs (hint: think CSI). My husband gave me my first digital camera and I love taking pictures of weddings and keiki.